Ko Phi Phi is the the world famous top ten of the tourist around the world which her picturesque character of two beautiful curve beach. It just only 40 Kms. from Ko Lanta. Our one day tour will bring you to visit both Phi Phi Don and Phi Phi Lay, the twin miracle island of Andaman sea. The sighting of Lime stone cliffs around the island and snorkeling among perfect coral and plenty of sea life. This tour also visit the Viking Cave with prehistoric painting and plenty of swallow net. 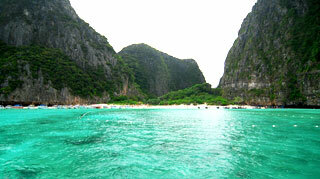 One of the highlight is to visit the Maya Beach, where the film "The Beach" was taken. The most famouse Maya bay at Ko Phi Phi, The Beach film was taken.